Russian manned lunar base. In 1974 Mishin was fired as head of the Korolev design bureau, the N1 was cancelled, together with the L3 and Zvezda DLB lunar base projects, However Glushko, Mishin's replacement, still considered the establishment of a moon base to be a primary goal for his country. Status: Cancelled 1974. Gross mass: 8,200 kg (18,000 lb). Height: 8.00 m (26.20 ft). While the Americans had achieved the first moon landing, they had retreated to earth orbit and cancelled further Apollo flights. There existed an opportunity, through establishment of a permanent Soviet moon base, to steal the lead in the space race. Analysis of the results of previous unmanned and manned lunar missions indicated that the moon was suited for a variety of 'special investigations'. A permanent manned lunar expeditionary complex (LEK) would be required to accomplish this. In August 1974 Glushko proposed having an LEK Lunar Base in place by 1980 using his new Vulkan booster. The Vulkan consisted of a large-diameter core stage surrounded six strap-on boosters. It would be powered by LOX-Kerosene engines developed by NPO Yuzhnoye in the Ukraine, in keeping with existing recommendations of the Ministry of Defense under Plan Poisk. The use of cryogenic propellants represented a complete turnaround for Glushko, who had advocated use of storable but toxic rocket propellants in a bitter fight with Korolev and Mishin for fifteen years. Total cost of the RLA launch vehicle development program alone was put at 12.5 billion rubles. After a poor reception of this concept by the Military-Industrial Commission, the Vulkan was redesigned to use the LOX/LH2 engine technology developed for the US Space Shuttle in the core stage. This would be surrounded by six strap-on boosters using LOX/Kerosene engines. This version of the Vulkan can be seen as a bridge concept leading to the core vehicle of the Energia/Buran launch vehicle authorized in 1976. The Vulkan was designed to deliver 230 metric tons into a 200 km low earth orbit; 60 metric tons to lunar orbit; and 22 metric tons to the lunar surface. NPO Energia engineers, using internal funds, elaborated designs for lunar base components over the next three years. These would take advantage of the payload capacity of the Vulkan and the Block R cryogenic stage to land complete housing units, laboratories, and long-distance rovers on the lunar surface of up to 22 metric tons mass. This would considerably simplify base build-up and operations compared to the 9 metric ton modules the N1 could deliver. The LEK consisted of expeditionary and transport lunar spacecraft (Chief Designer K D Bushuyev) and equipment for the permanent base station (Chief Designer I S Prudnikov). LEK (Lunar Expeditionary Spacecraft). 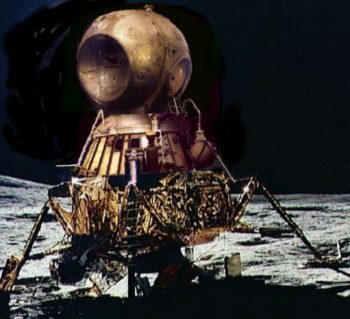 As in the original LK lunar lander, this would be taken to near zero velocity near the lunar surface by the Vulkan Block V 'lunar crasher' rocket stage. It would then descend to the lunar surface using a landing stage nearly identical to the American lunar module descent stage. This landing stage however would primarily provide propulsion of the upper ascent/earth recovery stage to a trans-earth trajectory. The ascent/earth recovery stage consisted of a re-entry capsule in the shape of, but larger than, the Soyuz descent module, encapsulated in a larger spherical pressurized compartment providing crew quarters and equipment storage. Without the constraints of having to dock with another spacecraft or station in lunar orbit, this direct flight approach would allow a base at any point on the surface to be supported at any time of the month. LZhM (Laboratory-Residence Module) for three men as the home base for living and working during the expedition. This used a simpler descent stage with minimal propellant for the soft landing on the moon following separation from its Block V lunar crasher stage. Lunokhod - a large manned wheeled mobile pressurized laboratory with a working radius of up to 200 km from the base. The Lunokhod would also be used for loading and unloading operations, and had a grader for burying the nuclear reactors which would power the complex and the laying out of 'streets' and protective berms for the base itself. LZM (Laboratory-Factory Module) provided biological and physics laboratories in two lobes. In the other was a factory for production of oxygen from the lunar soil. This used the same simple descent module as the LZhM. Nuclear power stations to power all of the modules of the lunar base. Each module of the complex was outfitted with its own autonomous power station. After landing, this would be removed from the landing stages and buried a distance away from the module before being put into operation. Transport spacecraft for delivery of expendable and consumable equipment and supplies to the surface. These would use the simple descent module. Preceding construction of the LEK would be reconnaissance by Ye-8 series unmanned craft developed by Lavochkin. These would conduct cartographic surveys, study the relief of the lunar surface, and obtain soil samples to a depth of 10 m from prospective sites. As in the earlier L3 and Zvezda concepts, the landers, having surveyed the site, would act as a radio location beacon for the precision landing of follow-on elements of the complex. Stage 1 - Three Vulkan launches would deliver the LZhM, Lunokhod (with scientific apparatus and consumables for 18 months), and an LEK with a crew of three. Stage 2 - Two Vulkan launches to land another LZhM, an open-cabin Lunokhod, and an LEK with a crew of three men for an occupation of six months. Stage 3 - One Vulkan launch of the LZM and further scientific apparatus (three months after the start of stage 2). This would give the base the capability to produce its own oxygen. Thereafter it would be necessary to resupply the base once a year with consumable supplies. Additional Vulkan launches would be made to rotate crews to the permanent base as necessary. The LEK study and initial Vulkan design were completed by the end of 1975. However the Academy of Sciences Expert Commission chaired by Keldysh decided in 1978 that the LEK Project should be deferred into the next century. Glushko and NPO Energia were told to quit dreaming and devote themselves only to projects with national economic importance, like the Buran space shuttle. This seemed to put a definitive end to the three major lunar base projects studied by Korolev, Mishin, and Glushko in 1962-1975. But Glushko simply waited. He restarted design work on a lunar base, using the Energia launch vehicle as the booster, after the first Buran launch in 1988. Because of the much lower payload capability of the Energia (88 metric tons to low earth orbit versus the 230 metric tons of the Vulkan) this would use a new LOK lunar orbital spacecraft (unrelated to the earlier Soyuz-based LOK) and an LK lander based on the Vulkan LEK lander. The LOK and LK lander would be inserted into lunar orbit by separate Energia launches. As in the earlier projects, prior to the Energia launches an unmanned Lunokhod would scout the region, allowing selection of a suitable landing site, and serve as a landing beacon for the precision LK landing. After rendezvous and docking in lunar orbit, three of the five crew aboard the LOK would transfer to the LK and descend to the lunar surface. After 5 to 10 days on the surface, the ascent stage of the LK would return to lunar orbit, and the crew would transfer back to the LOK. The LOK would remain in lunar orbit for a full lunar day (29 days) until returning to earth. This proposal did not attract support and further development of the concept was not continued. Thus ended 20th century lunar base studies in Russia. Concepts were revived in the next century, but with no chance of financial support. Crew Size: 2. Habitable Volume: 25.00 m3. Electric System: 8.00 average kW. Family: Lunar Bases, Moon. Country: Russia. Spacecraft: LEK, Lunokhod LEK, LZhM, LZM. Launch Vehicles: Energia. Agency: Korolev bureau. Bibliography: 89, 6652.